I still remember the Jefferson City Library in Jefferson City Missouri. We lived there off and on from the time I was four until the time I was 10 and on Saturdays when my mom went to do the grocery shopping (across the street from the library) she would drop me off. That was the library where i did the incentive program with the map one summer. You colored in each little square of the map for each book that you read, like you were on your way to treasure. I filled up four of them that summer. 1. Storm Lake, IA, Carnegie Library – sitting at the little round table in the round turret of the kids room in basement, poring over possible take-homes while my mom was… ?… upstairs in the big people’s library. 3. Half Moon Bay CA – the library was right next to the school where I taught Kindergarten – I would just trip over there after school every week or so to exchange those due for the next dozen for our bookshelves. 4. Making use of the baby grand piano room, 2nd floor, at the Mpls downtown library, when I was still in an apartment and had no space for a piano. Do they still have that? Yes, they still have the Piano Room downtown. Back in the old days on the trail, I recall VS comment several times on Dale’s choice of topic for the day. It usually had to do with news that VS had anticipated would grab Dale’s imagination, often related to astronomy or space. Today is such a day for me, but I got it wrong. I’m not disappointed to be libraries instead of black holes, but WOW, baboons, don’t we live in interesting times? And the door isn’t shut yet on stories about black holes. My guess is, the door’s just opening. I’m not a science nerd by a long stretch, but even I can see what an incredible accomplishment this is. Had it been published on April1, I wouldn’t have believed it. Libraries have, over the years, served many different needs for me. I don’t have a specific “favorite” library memory, but I do have fond memories associated with specific libraries. For instance, it was at the F.E. Warren Air Force Base in Cheyenne that I stumbled on a large collection of LP records of The Weavers and other early “folk” groups. Considering how random and haphazard my delving into to both literature and music was, I often marvel at the meandering path I’ve followed and the marvelous discoveries I made along the way. During my years at SIU, I spent considerable time at the Morris Library; not that I was necessarily studying. A friend, and fellow English major, and I, would sometimes sit between classes, with library supplied head phones on, listening to the same classical music selection. Then we’d head to the student union for a cup of coffee and discuss the merits of the recording we had just listened to. I recall on one occasion running into this friend at the library’s front desk. He was returning some books on playing chess for which a late fee was due. “I suppose we could call you a chess nut,” I quipped. Without missing a beat he replied: “Considering where we are, we could even call me a chess nut in an open foyer.” Ah, sweet college memories! Can’t tell you how much I’m looking forward to having these cataracts removed. At the moment it’s our own Chris that’s speaking in my head, slowly, and not as clearly as I wished due to my compromised vision. Not a chess nut resting in an open foyer? Is there an emoji for a groan? I like libraries, of course, but didn’t grow up as a regular library goer. My parents weren’t library habitués and the local library was quite far from our house. These days I rarely use the library, mostly because I have thousands of books of my own, all of them acquired because I was interested in reading them. Also, I find that the library seldom has the books I am looking for, at least not without having to resort to an interlibrary loan. Back in the ’90s, I joined the University of Minnesota Alumni Association, initially because it got me an email address and a connection to the internet but also it gave me borrowing privileges at the U of M libraries. The collections there were amazing and I spent hours roaming the stacks. What was remarkable were the rare and valuable books you could actually check out and take home. I remember checking out an original copy of Ancient Monuments of the Mississippi Valley by E. G. Squier and Edwin Davis from Walter Library. It’s an impossibly rare and valuable book published in about 1850 as volume 1 of the Smithsonian Contributions to Knowledge. (I’ll probably reference this book again if Barbara ever gets around to writing about the Trempealeau excavations.) At some point, the alumni association stopped offering library privileges as a perk of membership and I quit the association. Robin worked in the library for several years and even now works as a fill-in at several Hennepin County libraries. She’s a heavy library user, which comports with her choice of reading material. We both especially love the old Carnegie libraries, which are a sort of platonic library ideal, and we used to make a point when traveling to seek out the library in any town we visited and to photograph the outstanding ones. 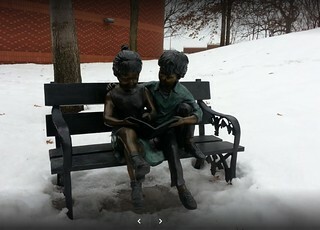 Bill, was the library of your childhood the one that is now Robbinsdale’s Art Center, on 42nd St.? Yes, that Tudor-style building. I’m glad it got more-or-less preserved but it’s a shame that Robbinsdale, to my knowledge, no longer has its own library. What does it tell you about a town that doesn’t have a library? Luverne had a Carnegie Library that is now used as a fine arts center. I spent hours in the old library when I was a child and teen. The new one lacks charm but has more books and space. Our current town has a lovely Carnegie library that has been expanded in the last 10 years and will bw expanded again. It is a really busy, living place . I have wonderful (but mixed) memories of the Ames Public Library in the 1950s. It was a typical granite and marble two story public building styled after classical Greek and Roman buildings. When you entered the main doors you confronted a large desk manned by librarians who often seemed determined to protect their books from grimy children. For a building designed for reading, the library was quite an echo chamber . . . all those stone walls and floors! Miraculously, the library was cool and comfortable on a steamy August day. The memory I treasure is of “The Little Theater.” This was a window box set into the walls of the library, just outside the entry doors. It was about three feet wide. The Little Theater was created to hold dioramas that depicted characters and actions from children’s books. The dioramas were populated by tiny figures such as puppet-maker Geppetto as he carves the puppet he would call Pinocchio. The displays were always changing. The dioramas were amateurish, yet they had a charm that is hard to explain. One message was clear: the library was hoping to share the delights on its shelves with children. Hilarious! Reminds me of this video of a couple of teens trying to figure out how a rotary phone works. OT – Here’s a rendition of Bohemian Rhapsody played on a church organ that blows me away. If you play it loud enough it may melt the snow.